Lots of dancing guitarists at last nights gig! I tried my best to capture their movements. The Orielles and Lylo are on a UK tour together this month but I think a few of the dates are sold out. First gig sketches of the year! I’ve got a couple of gigs scheduled in February->May so watch this space for more drawings. I was running late and missed sketching Soeur at this gig. They’re great live and you can find sketches from last year here. The sketch of Yr Poetry is incomplete because I saw them preform in the same room around a month ago and I like that sketch. You can find it here. The microphone shaped like a phone with a jack lead coming out the side is very cool but only used for a few songs and I couldn’t draw fast enough! 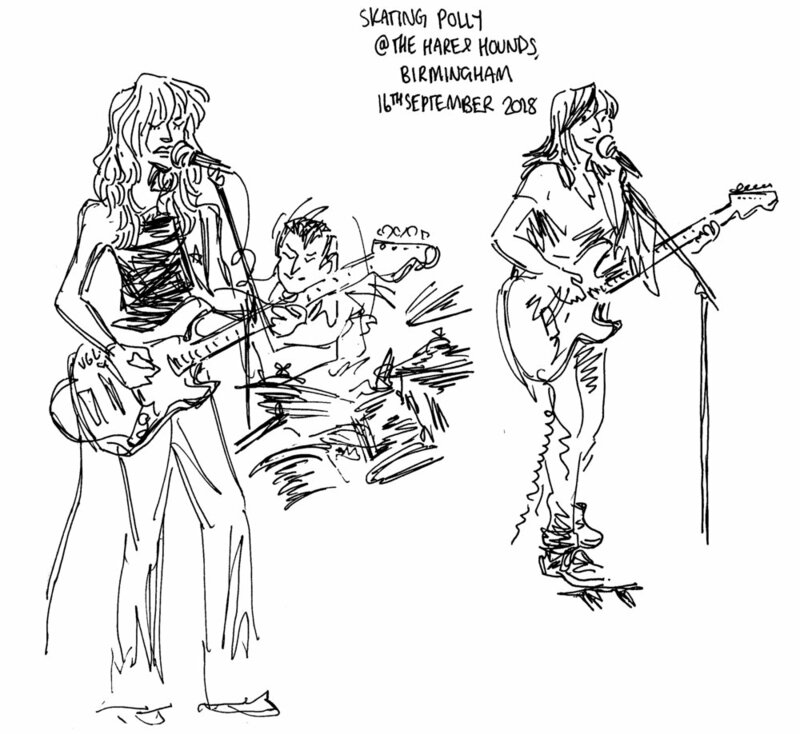 For advent I’m going to be posting gig sketches daily over Christmas and New year with links to all the bands. You can follow along starting here. Great line up at the Hare & Hounds on Wednesday night! Yr Poetry had a telephone microphone which I wasn’t quick enough to draw, and Kermes were much more energetic and I regret not trying to capture their front woman with multiple faster guesture drawings. Hopefully I can see them another time! Sorry for the delay getting these online! I had some print deadlines early this week. Skating Polly are still out touring in Europe and America - full dates here. I’m also in the middle of preparing for Thought Bubble festival this weekend. 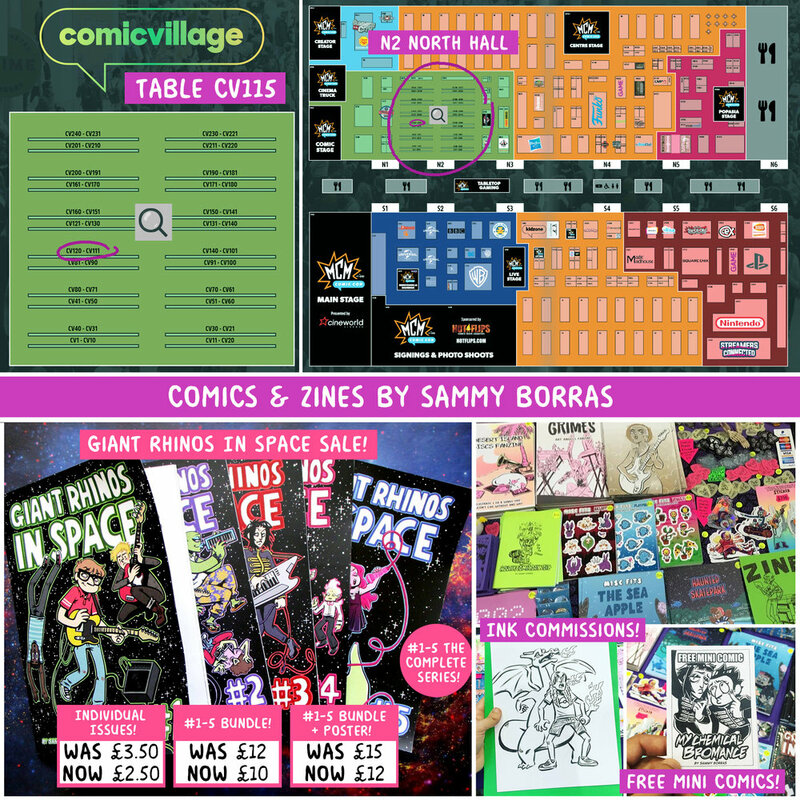 You’ll be able to find my comics and zines at table 56, Ask For Mercy Marquee (Just outside the Town Hall). For full information and a map please visit the events section of my website! See you there! Back over at the Hare and Hounds for Goat Girl and The Cosmics last night. Really loved trying to draw all the extra stage props while waiting for the bands to play, even if it was difficult to see in the dark. Winding down a beautiful summery day sketching Anna Burch, Hatchie and Hoopla Blue at the Hare and Hounds. Hoopla Blue played some new music and mentioned recording stuff soon so look out for that! Back over at the Hare & Hounds for Goat Girl later so hopefully more sketches to come!